Word of mouth is the only type of marketing you can get without spending a cent or making an effort. Well, aside from making sure your brand is worth talking about. But, this is a double-edged sword. In a perfect world, people would have only words of praise for your business. In reality, you need to come to terms that there will be negative criticism as well. This negative type of word of mouth can seriously affect the way people see your brand and ultimately lead to your downfall. Unless you react in time. 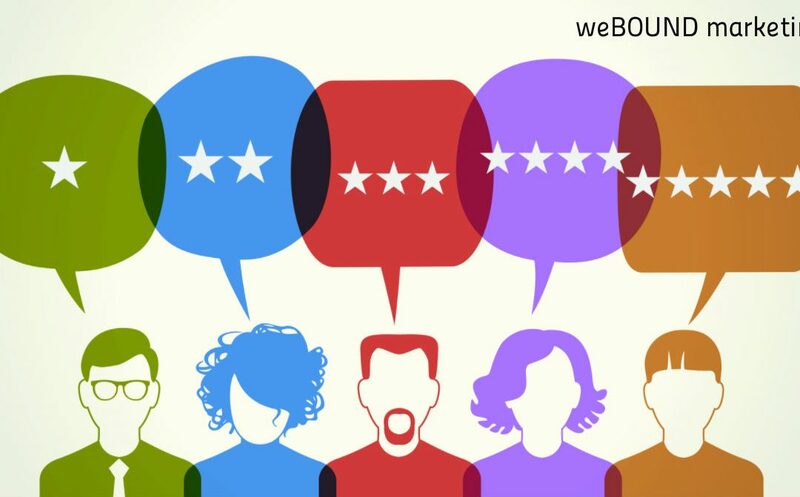 In fact, according to a study done by BrightLocal, 88% of consumers said they trusted online reviews as much as personal recommendation. That’s quite a big deal when you come to think of it. Imagine you needed a new hairstylist and a friend recommended you one. That recommendation would probably carry a lot of weight and you would go check that hairstylist out, right? However, when it comes to the negative reviews, eMarketer discovered that 80% of people said that negative comments online changed their purchasing decision. These numbers shouldn’t scare you. Instead, they should motivate you to track what people are saying about your brand and address that feedback whether it’s positive or negative. This way, you will be able to connect with your customers and supporters and create a more personal bond with them. And you’ll get the chance to do damage control by addressing the negative reviews. Besides, reading these comments will allow you to actually see what makes your audience tick, what they love about you and what they don’t. And then, you’ll know exactly how to tweak your products and services to appeal to them and grow your business. Today I’m bringing you 5 tools and platforms for tracking what people are talking about you online. Google has a plethora of useful tools marketers around the globe can’t live without. Google Alerts is one of them. This tool searches the Internet for the keywords you choose and sends you email notifications according to the preferences you set. The best part about Google Alerts is that it’s versatile and super simple to use. 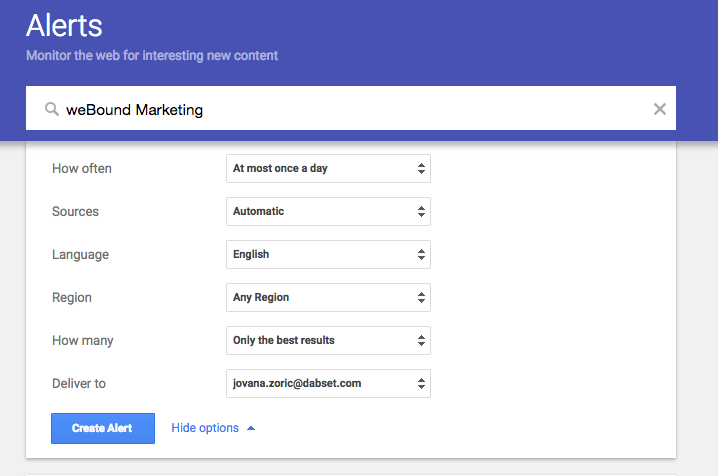 To set it up, just go to GoogleAlerts, type in the keyword you want to track (the name of your business) and choose the options before setting up the Alert. You can decide how often Google will be sending you notifications, what sources will be relevant (blogs, news, books, discussions, etc. ), the language and the region in which your keyword is mentioned and so on. Google Alerts is great when you just want to dip your feet into the pool of online mentions. But as you get used to the practice, it may not be enough for you because it doesn’t cover social media. Switching the focus to social media, HowSociable is one of the most detailed and versatile tracking tools out there. This tool helps you check your brand’s presence on up to 36 popular social websites. We’re talking Facebook, Twitter, Youtube, Pinterest, Tumblr, LinkedIn and others. However, while there is a free version of the tool, be prepared to switch to a paid pro account to have sneak peek at the most popular social networks. HowSociable will give you a comprehensive look of the social network activity related to your brand and even calculate the score for each platform so you can see your brand’s strengths and weaknesses and improve your strategy. And, you will also get to spy on the same data from your competitors. If you love using Twitter for your business, there’s more good news. TweetDeck is another tracking tool that will allow you to monitor your brand systematically and in real time. That means you get all the crucial info as it appears online so you can act instantly. With TweetDeck Dashboard, you can have all the necessary information about your brand on Twitter at a glance. You can track keyword searches, hashtag searches, even monitor your followers’ tweets, replies and lists. Although this platform is focused on the results from Twitter, it also allows you to track what’s happening with your Facebook and LinkedIn accounts. Mention is an amazing tracking tool, and one of my personal favorites. The reason why it’s so great is that it incorporates the sources from Google Alerts and adds social media to the mix. So, with Mention, you get the insight into what people are talking about all across the web using just one tool. Get started by heading over to Mention and creating an account to begin your free trial. Type in the name of your brand or any other keyword you want to track, and then set up the sources. Mention lets you in on the information found on websites, blogs, news, forums, videos, Facebook, Twitter, Instagram and YouTube. As soon as somebody mentions your brand, Mention will send you an email with a link directly to the content where you were mentioned. That way you can immediately engage with your audience and respond to their comments. However, a research this extensive doesn’t come for free. After the free trial, if you like the tool, you will have to choose among the paid packages. Going back to Twitter and Instagram but with a different goal in mind. This time, we’re snooping on influencers to see what they’re talking about us. Of course, the bigger the business, the more sense it makes to use this tool because you can’t really expect a lot of influencer mentions if you’re only starting out. In case you’re not familiar with influencers, head to my other blog post that explains exactly why influencers are the future of online marketing. In a nutshell, influencers are people with huge numbers of social followers, which is why their opinion could highly affect consumer purchase decision. Using Keyhole, you can find out what these people are talking about your brand, your competitors or your niche in general. Doing a research on your brand is more than just a sound business decision, it’s crucial if you want to stay on top of your competition. But tracking what people talk about you is only half of the job done. Once you start monitoring the mentions, you need to get hands on about them. Engage with your audience, make it personal and start a conversation. Whether you’re dealing with positive or negative feedback, leverage that information to get closer to your audience and improve your brand.